For other uses, see Belle Époque (disambiguation). The Belle Époque or La Belle Époque (French: [bɛlepɔk]; French for "Beautiful Era") was a period of Western history. It is conventionally dated from the end of the Franco-Prussian War in 1871 to the outbreak of World War I in 1914. Occurring during the era of the French Third Republic (beginning 1870), it was a period characterized by optimism, regional peace, economic prosperity, an apex of colonial empires, and technological, scientific, and cultural innovations. In the climate of the period, especially in Paris, the arts flourished. Many masterpieces of literature, music, theater, and visual art gained recognition. The Belle Époque was named in retrospect when it began to be considered a "Golden Age" in contrast to the horrors of World War I. The Belle Epoque was a period in which, according to historian R.R. Palmer, "European civilization achieved its greatest power in global politics, and also exerted its maximum influence upon peoples outside Europe." In the United Kingdom, the Belle Époque overlapped with the late Victorian era and the Edwardian era in a period known as Pax Britannica. In Germany, the Belle Époque coincided with the reigns of William I, Frederick III and the Wilhelminism of Wilhelm II. In Italy, with the reigns of Victor Emmanuel II, Umberto I and early of the reign of Victor Emmanuel III. In Russia, with the reigns of Alexander III and Nicholas II. In the United States, emerging from the Panic of 1873, the comparable period was the Gilded Age (1870s-1900s). In Brazil, it started with the end of the Paraguayan War. And in Mexico, the period was known as the Porfiriato. The French public's nostalgia for the Belle Époque period was based largely on the peace and prosperity connected with it in retrospect. 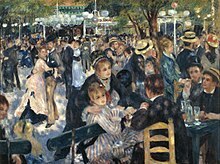 Two devastating world wars and their aftermath made the Belle Époque appear to be a time of joie de vivre (joy of living) in contrast to 20th century hardships. It was also a period of stability that France enjoyed after the tumult of the early years of the French Third Republic, beginning with France's defeat in the Franco-Prussian War, the Paris Commune, and the fall of General Georges Ernest Boulanger. The defeat of Boulanger, and the celebrations tied to the 1889 World's Fair in Paris, launched an era of optimism and affluence. French imperialism was in its prime. It was a cultural center of global influence, and its educational, scientific and medical institutions were at the leading edge of Europe. It was not entirely the reality of life in Paris or in France, however. France had a large economic underclass who never experienced much of the Belle Époque's wonders and entertainments. Poverty remained endemic in Paris's urban slums and rural peasantry for decades after the Belle Époque ended. Conflicts between the government and the Roman Catholic Church were regular during the period. Some of the artistic elite saw the Fin de siècle in a pessimistic light. Those who were able to benefit from the prosperity of the era were drawn towards new forms of light entertainment during the Belle Époque, and the Parisian bourgeoisie, or the successful industrialists called nouveau-riches, became increasingly influenced by the habits and fads of the city's elite social class, known popularly as Tout-Paris ("all of Paris", or "everyone in Paris"). The Casino de Paris opened in 1890. For Paris' less affluent public, entertainment was provided by cabarets, bistros and music halls. The Moulin Rouge cabaret is a Paris landmark still open for business today. The Folies Bergère was another landmark venue. Burlesque performance styles were more mainstream in Belle Époque Paris than in more staid cities of Europe and America. Liane de Pougy, dancer, socialite and courtesan, was well known in Paris as a headline performer at top cabarets. Belle Époque dancers such as La Goulue and Jane Avril were Paris celebrities, who modelled for Toulouse-Lautrec's iconic poster art. The Can-can dance was a popular 19th-century cabaret style that appears in Toulouse-Lautrec's posters from the era. The Eiffel Tower, built to serve as the grand entrance to the 1889 World's Fair held in Paris, became the accustomed symbol of the city, to its inhabitants and to visitors from around the world. Paris hosted another successful World's Fair in 1900, the Exposition Universelle. Paris had been profoundly changed by the French Second Empire reforms to the city's architecture and public amenities. Haussmann's renovation of Paris changed its housing, street layouts, and green spaces. The walkable neighbourhoods were well-established by the Belle Époque. A 1900 cartoon from magazine Le Frou Frou (signed "Jan Duch") satirizing a style trend favoring small breasts (a large bosom may still be acceptable in the provinces, but not in Paris!). A "boyish figure" didn't actually become a mainstream fashion ideal until the 1920s. Cheap coal and cheap labor contributed to the cult of the orchid and made possible the perfection of fruits grown under glass, as the apparatus of state dinners extended to the upper classes. Exotic feathers and furs were more prominently featured in fashion than ever before, as haute couture was invented in Paris, the center of the Belle Époque, where fashion began to move in a yearly cycle. In Paris, restaurants such as Maxim's Paris achieved a new splendor and cachet as places for the rich to parade. Maxim's Paris was arguably the city's most exclusive restaurant. Bohemian lifestyles gained a different glamour, pursued in the cabarets of Montmartre. Fashion in the Belle Epoque era was the peak of luxury living for a select few. Not only did this era bring in new trends to fashion, they also kept trends from the Edwardian trends. The Belle Epoque was very different from the Edwardian era even though they used the styles because the garments were not influenced by the English King or the Prince of Wales. They wanted nothing to do with the era. Clothes were specifically designed and marketed for those extremely wealthy and those who were privileged. These garments covered most garments from daily wear to formal gowns. It is hard to distinguish between the two because of how similar they evolved. La Belle Epoque heavily influenced by custom designs and tailor-made garments. At this time clothing began to change for women becoming functional. After the Prussian war the fullest part of a women’s skirts, started to move to the back with draped overskirts that were supported by bustles. The necklines were still high with narrow sleeves with the tendency to flare slightly at the wrist. Evening gowns start to become a little more risky with low necklines and off the shoulder sleeves. This was for women to show off their jewelry that symbolized their class status. Towards the end of the 1870s the corset started to appear in women’s wear. As women start to turn away from the bustle, it again comes back to creating the S-shape making it fuller all the way around. This also eliminated the long trains that were typical for a women’s dress. This S-shape figure all women were going for was also known as the hobble-skirts. As the years go on, the bustle disappears from women’s wardrobes constructing a slimming tight fitting dress for women. This look elongated women’s body, along with making this a more functional look. Though they didn’t have a bustle, the women now had dresses and blouses that were pulled and puffed in the front, resulting in what was called a “Pigeon Breast” at the time. Mens fashion at this time didn’t change much compared to women’s fashion. Some changes in Mens fashion like frock coats and three piece suits but nothing too extreme. French cuisine continued to climb in the esteem of European gourmets during the Belle Époque. The word "ritzy" was invented during this era, referring to the posh atmosphere and clientele of the Hôtel Ritz Paris. The head chef and co-owner of the Ritz, Auguste Escoffier, was the pre-eminent French chef during the Belle Époque. Escoffier modernized French haute cuisine, also doing much work to spread its reputation abroad with business projects in London in addition to Paris. Champagne was perfected during the Belle Époque. 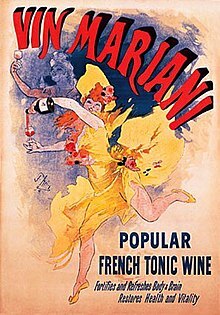 The alcoholic spirit absinthe was cited by many Art Nouveau artists as a muse and inspiration and can be seen in much of the artwork of the time. Large public buildings such as the Opéra Garnier devoted enormous spaces to interior designs as Art Nouveau show places. After the mid-19th century, railways linked all the major cities of Europe to spa towns like Biarritz, Deauville, Vichy, Arcachon and the French Riviera. Their carriages were rigorously divided into first-class and second-class, but the super-rich now began to commission private railway coaches, as exclusivity as well as display was a hallmark of opulent luxury. The years between the Franco-Prussian War and World War I were characterized by unusual political stability in western and central Europe. Although tensions between the French and German governments persisted as a result of the French loss of Alsace-Lorraine to Germany in 1871, diplomatic conferences, including the Congress of Berlin in 1878, the Berlin Congo Conference in 1884, and the Algeciras Conference in 1906, mediated disputes that threatened the general European peace. Indeed, for many Europeans in the Belle Époque period, transnational, class-based affiliations were as important as national identities, particularly among aristocrats. An upper-class gentleman could travel through much of Western Europe without a passport and even reside abroad with minimal bureaucratic regulation. World War I, mass transportation, the spread of literacy, and various citizenship concerns changed this. The Belle Époque featured a class structure that ensured cheap labor. The Paris Metro underground railway system joined the omnibus and streetcar in transporting the working population, including those servants who did not live in the wealthy centers of cities. One result of this commuting was suburbanization allowing working-class and upper-class neighborhoods to be separated by large distances. Meanwhile, the international workers' movement also reorganized itself and reinforced pan-European, class-based identities among the classes whose labor supported the Belle Époque. The most notable transnational socialist organization was the Second International. Anarchists of different affiliations were active during the period leading up to World War I. Political assassinations and assassination attempts were still rare in France (unlike in Russia) but there were some notable exceptions, including President Marie François Sadi Carnot in 1894. A bomb was detonated in the Chamber of Deputies of France in 1893, causing injuries but no deaths. Terrorism against civilians occurred in 1894, perpetrated by Émile Henry, who killed a cafe patron and wounded several others. France enjoyed relative political stability at home during the Belle Époque. 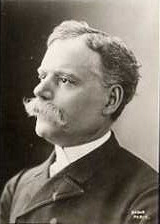 The sudden death of President Félix Faure while in office took the country by surprise, but had no destabilizing effect on the government. The most serious political issue to face the country during this period was the Dreyfus Affair. Captain Alfred Dreyfus was wrongly convicted of treason, with fabricated evidence from French government officials. Anti-Semitism directed at Dreyfus, and tolerated by the general French public in everyday society, was a central issue in the controversy and the court trials that followed. Public debate surrounding the Dreyfus Affair grew to an uproar after the publication of J'accuse, a letter sent to newspapers by prominent novelist Émile Zola, condemning government corruption and French anti-Semitism. The Dreyfus Affair consumed the interest of the French for several years and it received heavy newspaper coverage. European politics saw very few regime changes, the major exception being Portugal, which experienced a republican revolution in 1910. However, tensions between working-class socialist parties, bourgeois liberal parties, and landed or aristocratic conservative parties did increase in many countries, and it has been claimed that profound political instability belied the calm surface of European politics in the era. In fact, militarism and international tensions grew considerably between 1897 and 1914, and the immediate prewar years were marked by a general armaments competition in Europe. Additionally, this era was one of massive overseas colonialism, known as the New Imperialism. The most famous portion of this imperial expansion was the Scramble for Africa. The Belle Époque was an era of great scientific and technological advancement in Europe and the world in general. Inventions of the Second Industrial Revolution that became generally common in this era include the perfection of lightly sprung, noiseless carriages in a multitude of new fashionable forms, which were superseded towards the end of the era by the automobile, which was for its first decade a luxurious experiment for the well-heeled. French automobile manufacturers such as Peugeot were already pioneers in automobile manufacturing. 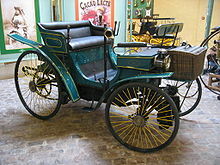 Edouard Michelin invented removable pneumatic tires for bicycles and automobiles in the 1890s. The scooter and moped are also Belle Époque inventions. A number of French inventors patented products with a lasting impact on modern society. After the telephone joined the telegraph as a vehicle for rapid communication, French inventor Édouard Belin developed the Belinograph, or Wirephoto, to transmit photos by telephone. The electric light began to supersede gas lighting, and neon lights were invented in France. France was a leader of early cinema technology. 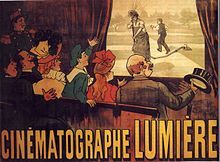 The cinématographe was invented in France by Léon Bouly and put to use by Auguste and Louis Lumière, brothers who held the first film screenings in the world. The Lumière brothers made many other innovations in cinematography. It was during this era that the motion pictures were developed, though these did not become common until after World War I. Although the aeroplane remained a fascinating experiment, France was a leader in aviation. France established the world's first national air force in 1910. Two French inventors, Louis Breguet and Paul Cornu, made independent experiments with the first flying helicopters in 1907. Henri Becquerel discovered radioactivity in 1896 while working with phosphorescent materials. His work confirmed and explained earlier observations regarding uranium salts by Abel Niépce de Saint-Victor in 1857. It was during this era that biologists and physicians finally came to understand the germ theory of disease, and the field of bacteriology was established. Louis Pasteur was perhaps the most famous scientist in France during this time. Pasteur developed pasteurisation and a rabies vaccine. Mathematician and physicist Henri Poincaré made important contributions to pure and applied mathematics, and also published books for the general public on mathematical and scientific subjects. Marie Skłodowska-Curie worked in France, winning the Nobel Prize for Physics in 1903, and the Nobel Prize for Chemistry in 1911. Physicist Gabriel Lippmann invented integral imaging, still in use today. In 1890, Vincent van Gogh died. It was during the 1890s that his paintings achieved the admiration that had eluded them during Van Gogh's life, first among other artists, then gradually among the public. Reactions against the ideals of the Impressionists characterized visual arts in Paris during the Belle Époque. 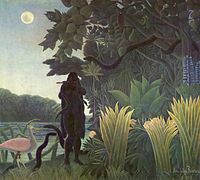 Among the post-Impressionist movements in Paris were the Nabis, the Salon de la Rose + Croix, the Symbolist movement (also in poetry, music, and visual art), Fauvism, and early Modernism. Between 1900 and 1914, Expressionism took hold of many artists in Paris and Vienna. Early works of Cubism and Abstraction were exhibited. Foreign influences were being strongly felt in Paris as well. The official art school in Paris, the École des Beaux-Arts, held an exhibition of Japanese printmaking that changed approaches to graphic design, particular posters and book illustration (Aubrey Beardsley was influenced by a similar exhibit when he visited Paris during the 1890s). Exhibits of African tribal art also captured the imagination of Parisian artists at the turn of the 20th century. Art Nouveau is the most popularly recognized art movement to emerge from the period. This largely decorative style (Jugendstil in central Europe), characterized by its curvilinear forms, and nature inspired motifs became prominent from the mid-1890s and dominated progressive design throughout much of Europe. Its use in public art in Paris, such as Hector Guimard's Paris Métro stations, has made it synonymous with the city. Prominent artists in Paris during the Belle Époque included post-Impressionists such as Odilon Redon, Gustave Moreau, Maurice Denis, Pierre Bonnard, Édouard Vuillard, Paul Gauguin, Henri Matisse, Émile Bernard, Henri Rousseau, Henri de Toulouse-Lautrec (whose reputation improved substantially after his death), Giuseppe Amisani and a young Pablo Picasso. More modern forms in sculpture also began to dominate as in the works of Paris-native Auguste Rodin. Although Impressionism in painting began well before the Belle Époque, it had initially been met with skepticism if not outright scorn by a public accustomed to the realist and representational art approved by the Academy. In 1890, Monet started his series Haystacks. Impressionism, which had been considered the artistic avant-garde in the 1860s, did not gain widespread acceptance until after World War I. The academic painting style, associated with the Academy of Art in Paris, remained the most respected style among the public in Paris. Artists who appealed to the Belle Époque public include William-Adolphe Bouguereau, the English Pre-Raphaelite's John William Waterhouse, and Lord Leighton and his depictions of idyllic Roman scenes. More progressive tastes patronized the Barbizon school plein-air painters. These painters were associates of the Pre-Raphaelites, who inspired a generation of esthetic-minded "Souls". Many successful examples of Art Nouveau, with notable regional variations, were built in France, Germany, Belgium, Spain, Austria (the Vienna Secession), Hungary, Bohemia and Latvia. It soon spread around the world, including to Brazil, Argentina, Mexico and the United States. European literature underwent a major transformation during the Belle Époque. Literary realism and naturalism achieved new heights. Among the most famous French realist or naturalist authors are Guy de Maupassant and Émile Zola. Realism gradually developed into modernism, which emerged in the 1890s and came to dominate European literature during the Belle Époque's final years and throughout the interwar years. The Modernist classic In Search of Lost Time was begun by Marcel Proust in 1909, to be published after World War I. The works of German Thomas Mann had a huge impact in France as well, such as Death in Venice, published in 1912. Colette shocked France with the publication of the sexually frank Claudine novel series, and other works. Joris-Karl Huysmans, who came to prominence in the mid-1880s, continued experimenting with themes and styles that would be associated with Symbolism and the Decadent movement, mostly in his book à rebours. André Gide, Anatole France, Alain-Fournier, Paul Bourget are among France's most popular fiction writers of the era. Among poets, the Symbolists such as Charles Baudelaire remained at the forefront. Although Baudelaire's poetry collection Les Fleurs du mal had been published in the 1850s, it exerted a strong influence on the next generation of poets and artists. The Decadent movement fascinated Parisians, intrigued by Paul Verlaine and above all Arthur Rimbaud, who became the archetypal enfant terrible of France. Rimbaud's Illuminations was published in 1886, and subsequently his other works were also published, influencing Surrealists and Modernists during the Belle Époque and after. Rimbaud's poems were the first works of free verse seen by the French public. Free verse and typographic experimentation also emerged in Un Coup de Dés Jamais N'Abolira Le Hasard by Stéphane Mallarmé, anticipating Dada and concrete poetry. Guillaume Apollinaire's poetry introduced themes and imagery from modern life to readers. Cosmopolis: A Literary Review had a far-reaching impact on European writers, and ran editions in London, Paris, Saint Petersburg, and Berlin. Paris's popular bourgeois theatre was dominated by the light farces of Georges Feydeau and cabaret performances. Theatre adopted new modern methods, including Expressionism, and many playwrights wrote plays that shocked contemporary audiences either with their frank depictions of everyday life and sexuality or with unusual artistic elements. Cabaret theater also became popular. Musically, the Belle Époque was characterized by salon music. This was not considered serious music but, rather, short pieces considered accessible to a general audience. In addition to works for piano solo or violin and piano, the Belle Époque was famous for its large repertory of songs (mélodies, romanze, etc.). The Italians were the greatest proponents of this type of song, its greatest champion being Francesco Paolo Tosti. Though Tosti's songs never completely left the repertoire, salon music generally fell into a period of obscurity. Even as encores, singers were afraid to sing them at serious recitals. In that period, waltzes also flourished. Operettas were also at the peak of their popularity, with composers such as Johann Strauss III, Emmerich Kálmán, and Franz Lehár. Many Belle Époque composers working in Paris are still popular today: Igor Stravinsky, Erik Satie, Claude Debussy, Lili Boulanger, Jules Massenet, César Franck, Camille Saint-Saëns, Gabriel Fauré and his pupil, Maurice Ravel. Modern dance began to emerge as a powerful artistic development in theatre. Dancer Loie Fuller appeared at popular venues such as the Folies Bergère, and took her eclectic performance style abroad as well. Sergei Diaghilev's Ballets Russes brought fame to Vaslav Nijinsky and established modern ballet technique. The Ballets Russes launched several ballet masterpieces, including The Firebird and The Rite of Spring (sometimes causing audience riots at the same time). Jules Massenet and Jean Richepin (the last as Apollo Citharoedus), authors of Le mage, premiered at the Opéra-Comique in Paris on 16 March 1891. ^ 1909-2002,, Palmer, R. R. (Robert Roswell),. A history of Europe in the modern world. Colton, Joel, 1918-2011,, Kramer, Lloyd S., (Eleventh ed.). New York, NY. ISBN 0076632857. OCLC 882719311. ^ "Incontestably the favorite flowers of the Belle Époque were orchids and calla lilies," (Gabriele Fahr-Becker, Art Nouveau 2007, p. 112; the fashion for orchids is narrated in Eric Hansen, Orchid Fever: A Horticultural Tale of Love, Lust, and Lunacy, 2000. ^ Weiss, Allen S. (2002). Feast and Folly: Cuisine, Intoxication, and the Poetics of the Sublime. SUNY Press. p. 113. ISBN 9780791455180. ^ The first Ford Model T, a car for the masses, rolled off the assembly line in 1908. ^ Mario d'Angelo (2013) La musique à la Belle Époque. Paris: Éditions du Manuscrit. La Belle Époque. New York: The Metropolitan Museum of Art. 1982. ISBN 0870993291. Wires, Richard. "Paris: La Belle Époque". Conspectus of History 1.4 (1977): 60–72. Cynthia Myntti, Paris Along the Nile: Architecture in Cairo from the Belle Époque, American University in Cairo Press, 2003. Trevor Mostyn, Egypt's Belle Époque: Cairo and the Age of the Hedonists, Tauris Parke Paperbacks, 2006. Bruna, D. (2015). Fashioning the body: An intimate history of the silhouette. New York: Published for Bar Graduate Center, Decorative Arts, Design History, Material Culture by Yale University Press. Wilcox, C. (2013). Fashion in detail 1700-2000. London: V & A. Look up Belle Époque in Wiktionary, the free dictionary. Moulin Rouge is a cabaret in Paris, France. Art Nouveau is an international style of art, architecture and applied art, especially the decorative arts, that was most popular between 1890 and 1910. A reaction to the academic art of the 19th century, it was inspired by natural forms and structures, particularly the curved lines of plants and flowers. Le Rire was a successful French humor magazine published from October 1894 until its final issue in April 1971. Founded in Paris during the Belle Époque by Felix Juven, Le Rire appeared as typical Parisians began to achieve more education, income and leisure time. Interest in the arts, culture and politics intensified during the Gay Nineties. Publications like this helped satisfy such curiosity. It was the most successful of all the "Journaux Humoristiques." The Folies Bergère is a cabaret music hall, located in Paris, France. Located at 32 rue Richer in the 9th Arrondissement, the Folies Bergère was built as an opera house by the architect Plumeret. It opened on 2 May 1869 as the Folies Trévise, with light entertainment including operettas, comic opera, popular songs, and gymnastics. It became the Folies Bergère on 13 September 1872, named after nearby rue Bergère. The house was at the height of its fame and popularity from the 1890s' Belle Époque through the 1920s. Jules Chéret was a French painter and lithographer who became a master of Belle Époque poster art. He has been called the father of the modern poster. Théophile Alexandre Steinlen, was a Swiss-born French Art Nouveau painter and printmaker. Louis-Jean-Sylvestre Majorelle, usually known simply as Louis Majorelle, was a French decorator and furniture designer who manufactured his own designs, in the French tradition of the ébéniste. He was one of the outstanding designers of furniture in the Art Nouveau style, and after 1901 formally served as one of the vice-presidents of the École de Nancy. Maxim's is a restaurant in Paris, France, located at No. 3 rue Royale in the 8th arrondissement. It is known for its Art Nouveau interior decor. Maxim's was regarded as the most famous restaurant in the world. René Georges Hermann-Paul was a French artist. He was born in Paris and died in Saintes-Maries-de-la-Mer. Maxim's Art Nouveau "Collection 1900"
Maxim's Art Nouveau "Collection 1900", also known as the Musée Art Nouveau - Maxim's, is a private collection of Art Nouveau objects and decor, located in the 8th arrondissement above Maxim's Paris restaurant at 3, Rue Royale, Paris, France. It is open for guided tours in afternoons except Monday and Tuesday; an admission fee is charged. A poster is any piece of printed paper designed to be attached to a wall or vertical surface. Typically posters include both textual and graphic elements, although a poster may be either wholly graphical or wholly text. Posters are designed to be both eye-catching and informative. Posters may be used for many purposes. They are a frequent tool of advertisers, propagandists, protestors, and other groups trying to communicate a message. Posters are also used for reproductions of artwork, particularly famous works, and are generally low-cost compared to the original artwork. The modern poster, as we know it, however, dates back to the 1840s and 1850s when the printing industry perfected colour lithography and made mass production possible. Georges Goursat (1863–1934), known as Sem, was a French caricaturist famous during the Belle Époque. Paris, the capital of France, has an active LGBT community. In the 1990s, 46% of the country's gay men lived in the city. As of 2004, Paris had 140 LGBT bars, clubs, hotels, restaurants, shops, and other commercial businesses. Florence Tamagne, author of "Paris: 'Resting on its Laurels'? ", wrote that there is a "Gaité parisienne"; she added that Paris "competes with Berlin for the title of LGBT capital of Europe, and ranks only second behind New York for the title of LGBT capital of the world." It has France's only gayborhoods that are officially organized. The term Années folles refers to the decade of the 1920s in France. It was coined to describe the rich social, artistic, and cultural collaborations of the period. The same period is also referred to as the Roaring Twenties or the Jazz Age in the United States. In Germany, it is sometimes referred to as the Golden Twenties because of the economic boom that followed World War I.
Jeanne Mammen was a German painter and illustrator of the Weimar period. Her work is associated with the New Objectivity and Symbolism movements. She is best known for her depictions of strong, sensual women and Berlin city life. Paris in the Belle Époque was a period in the history of the city between the years 1871 to 1914, from the beginning of the Third French Republic until the First World War. It saw the construction of the Eiffel Tower, the Paris Métro, the completion of the Paris Opera, and the beginning of the Basilica of Sacré-Cœur on Montmartre. Three lavish "universal expositions" in 1878, 1889 and 1900 brought millions of visitors to Paris to sample the latest innovations in commerce, art and technology. Paris was the scene of the first public projection of a motion picture, and the birthplace of the Ballets Russes, Impressionism and Modern Art. The architecture of Paris created during the Belle Époque, between 1871 and the beginning of the First World War in 1914, was notable for its variety of different styles, from neo-Byzantine and neo-Gothic to classicism, Art Nouveau and Art Deco. It was also known for its lavish decoration and its imaginative use of both new and traditional materials, including iron, plate glass, colored tile and reinforced concrete. Notable buildings and structures of the period include the Eiffel Tower, the Grand Palais, the Théâtre des Champs-Élysées, the Gare de Lyon, the Bon Marché department store, and the entries of the stations of the Paris Metro designed by Hector Guimard. Léopold-Émile Reutlinger was a French photographer who came from a successful German-Jewish family of photographers. His uncle and founder of the success was the photographer Charles Reutlinger, his father the photographer Émile Reutlinger. His son Jean was also a photographer.